How to search a Chatbot on Facebook? You can search a chatbot like you would search a "Page" on Facebook. 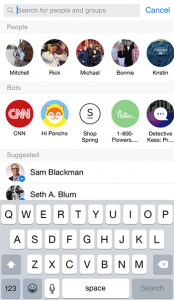 Although chatbots can only be found on the Facebook Messenger App so it would be ideal if you search there instead of Facebook search directly. Just type in the name of the chatbot in search (on top most of the app) and you will get your page/chatbot in response. With Facebook chatbot not only your page gets more visibility through Facebook's trending chatbot section but also gets priority in search because of quick response time. Here is how it looks when you search it on facebook.com/m.me/messenger application.